The idea of a grotto in the parish to promote prayer to our lady was first mentioned by the late Rev. Fr. John Egan. He had a great devotion to our Lady and passed this on to his parishioners. This devotion helped the inspiration to build a grotto and it was not generally known until recently of the late Fr. J. Egan’s wishes for a grotto. Mrs. Annie Verdon was impressed by a grotto in Strokestown, Co. Roscommon and thought it would be a nice idea to build a grotto in the parish of Ransboro around the time of the Marian year a few years ago. In 1989 the grotto plan was given the blessing and encouragement of his lordship Dr. Conway, Bishop of Elphin, and Fr. Liam Devine. This was a major step and fundraising started. A free site was acquired through the kindness of two local people. Local people did most of the preparation work. A surrounding wall was built. The statues were ordered in 1990. These were handcrafted from marble and are maintenance free. Fund raising continued and the debt was soon paid. The design is based on the Lourdes Grotto where our Lady appeared to Bernadette Soubirous (now St.Bernadette) a 14-year-old girl in 1858. From Feb 11th to July 16th that year Our Lady appeared several times. The visions were declared authentic by the pope in 1862. 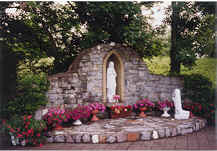 The location of the Kellystown Grotto is very peaceful and an encouragement for people to stop for a moment to pray to our Lady who Fr. Peyton, the renowned rosary priest, so eloquently described her as the daughter of the Heavenly Father, the spouse of the Holy Spirit and the Mother of God. His Lordship Most Rev. Dr. Conway, Bishop of Elphin, officially opened Kellystown Grotto on Sunday May 5th 1991. At 5:00pm he blessed the grotto and was assisted by Fr. J. Gilmartin and priests who had ministered in the Ransboro area over the years. After the blessing the Rosary was recited. There was tea and refreshments in Ransboro School Hall afterwards. The Rosary is now recited every Sunday at 6pm from May to October at the grotto. Mass is also celebrated there once a year.